Genuine 12mm Rose Quartz. Genuine 8mm Rose Quartz. Genuine 4mm Rose Quartz. 19mm 925 Sterling Silver French Hooks. They swing and sparkle with your every move! Type:Gemstone Shoes Slipper Dangle Drop Hook Ear Earrings. Size (Approx): Stone: 21mmx8mm. Here you will find the highest quality jewelry in low price. We will try our best to resolve the issues. UK: AM1:00-AM9:00. US: PM 6:00-AM2:00. Our working schedule. Gems Info: natural oval rose quartz, good quality, high luster! hook : gold plated hook. length: 2.6"(Earrings). WE WILL DO OUR BEST TO RESOLVE YOUR PROBLEM AND ISSUE. RETURAN POLICY. 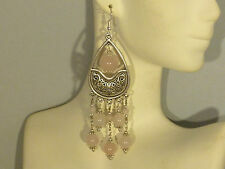 925 SOLID Silver PINK ROSE QUARTZ Gem BESTSELLER New CELTIC Earrings 1"
Earrings (3841). Gemstone : Rose Quartz (Genuine). Gemstone Size : 10 x 14 mm. Gemstone Shape : Oval. Gemstone Total Carat Weight : 12.2. Earrings Weight : 6.8 Grams (Approx.). New Arrivals. NEW ARRIVALS (1154). Gems Info: Fresh water cultured pearl, purple pearl, rose quartz flower, pink shell flower, pink rondelle crystal, good quality, high luster! hook: 925 Silver hook. For Reiki, Crystal Healing, Chakra Healing or just for its beauty. Rose Quartz is a mothering crystal, inspiring nurturing of the self if one has lost their own mother. It promotes bonding and is a good stone to place on the stomach during pregnancy, and to take to the hospital to be near the baby during birth. Type:Gemstone Shoes Slipper Dangle Drop Hook Ear Earrings. Size (Approx): Stone: 21mmx8mm. We will do our best to solve your problem. Condition: New. 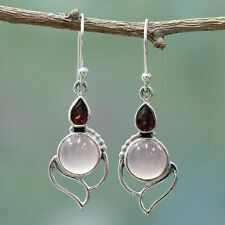 925 Sterling Silver Earrings with Oval Faceted Rose Quartz Gemstones. Highly polished sterling silver with faceted rose quartz gemstone. Earrings With Rose Quartz Gemstones. Material: 925 Sterling Silver & Rose Quartz. Chan uses hand cut semi-precious stones, beads, and colored fresh water pearls. Her trademark is an artistic skill combining unusual forms with beautiful colors to create truly striking pieces. Material: sterling silver, rose quartz, and pink stones. Gemstone Stud Wedding Hoop Proposal Antique Fire Fashion Earrings Silver Opal. Material: Alloy. Fashion elegant design provide you the most charming look. We will reply you ASAP. Match all kinds of clothes and dresses.